31st October 1795. London, England. John Keats was the son of Thomas Keats and Frances Jennings. In 1802 his father took over the management of Frances’s father’s livery stable and Inn and died In 1804 in a riding accident. John Clarke’s School, Enfield, London. 1797: Birth of his Brother George. 1799: Birth of his Brothers Thomas and Edward (Edward died in infancy). 1802: The Keats family moved to Enfield, London. 1803: Birth of his sister Frances. 1804: Death of Keats’s father Thomas. Mother remarried to Rawlings and disappeared. 1805: Death of his Grandfather. 1809: His Mother returns to Enfield but is seriously ill and dies. Keats is apprenticed to an Apothecary in Edmonton. 1816: First poem “Oh Solitude” published. Becomes a licensed Apothecary. 1816: John Keats meets Percy Bysshe Shelley. Takes lodgings in Hampstead, London. 1817: He visits the Isle of Wight and Oxford. Meets William Wordsworth. 1818: His brother George leaves for the USA Keats goes on a walking tour of Scotland with Charles Brown. Meets Fanny Brawne. Death of his brother Tom. Moves to Wentworth Place, Hampstead. 1819: John Keats visits Chichester, West Sussex in January with Brown and stays with the parents of his friend Charles Dilke in Eastgate Square. Whilst lodging there he began to write ” The Eve of St Agnes” and he was probably inspired to write the poem by the ancient buildings and passageways of Chichester Cathedral which he visited. Taken ill again he returns to London and takes rooms in the City. Moves back to Hampstead in October and becomes secretly engaged to Fanny Brawne. Meets Samuel Taylor Coleridge on a walk on Hampstead Heath. Brother George visits England. 1820: Begins his last illness in February. Moves to lodgings in Kentish Town. Moves in with Leigh-Hunt after a major Hemorrhage. Moves into the Brawne household in the autumn for a month. On doctors advice sails to Italy in September. 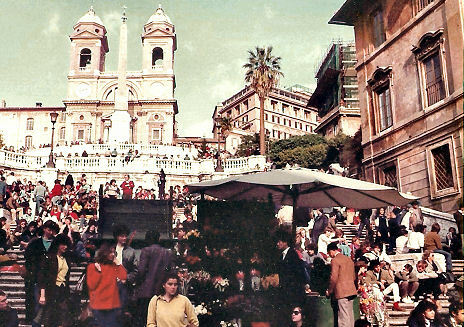 1821: Keats takes up lodgings next to the Spanish Steps in Rome where his friend the painter Joseph Severn nurses him. 1819: “Ode to the Nightingale”. (1878): “Letters to Fanny Brawne”. Never married though engaged to Fanny Brawne. 23rd February 1821. Rome, Italy of Tuberculosis. English Protestant Cemetery, Rome, Italy. Dove Cottage and Museum, Grasmere, LA22 9SH. (Wordsworth Trust). Castlerigg Stone Circle, near Keswick. (described in “Hyperion”). Lulworth Cove composed “Bright Star” after a sailing trip. 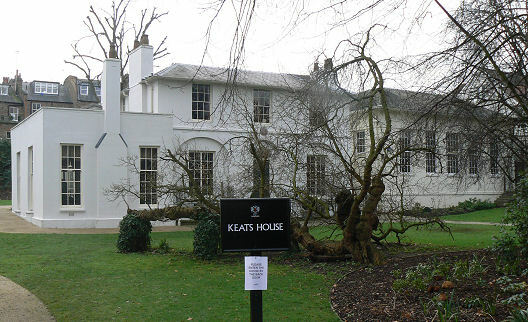 Keats House, Wentworth Place, Keats Grove, Hampstead, NW3 2RR. Eastgate Square and the Cathedral Cloisters, Chichester.